An Informative, On-Demand Webinar from SRL Group. There are more than two million web pages for doctors. Do you wonder how Google decides which one is #1? Getting a top position in organic search is a huge priority for most medical practices. But getting to the top search result is incredibly difficult and technically challenging. Google has more than 200 algorithmic factors to determine top search position in organic search? Your website’s speed and mobile friendly programming can be equally important as its content. The top 5 organic search results get 75% of search traffic. 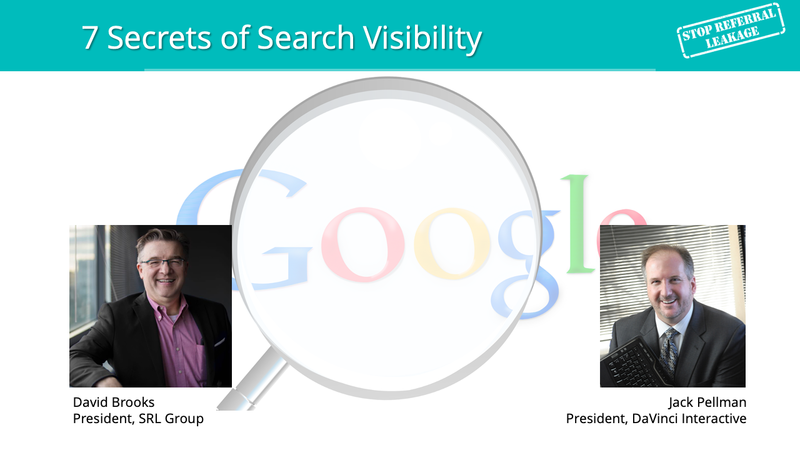 In this informative webinar, web marketing experts David Brooks (SRL Group) and Jack Pellman (Davinci Interactive) will highlight the important (and not obvious) factors that help you rank highly in organic search results. How to make your website search-engine friendly. How to focus your marketing programs on the patients that are ready to book? Register now and take your website’s search rank to the new level! David has extensive experience in healthcare web marketing companies. He is a co-founder of HealthPlatforms, Inc. Co-founder, CEO and President of Davinci Interactive. Prior to forming Davinci Interactive, Jack was President and CEO of MedNet Technologies (MedNet), a pioneer in developing custom websites for physicians and dentists. Jack’s company built more than 3,500 websites for dental, medical and veterinary practices before his company was acquired Advice Media in 2015. Get all the referrals you deserve™. Our counselors are data-driven experts, monitoring and measuring your practice’s online presence and performance. We use proprietary software tools and methods to link promotional activities to financial outcomes. We work directly with your operations staff to implement best practices for marketing. Dr. Leonardo is an eHealth Internet Presence Platform featuring an automated SaaS profile-sitebuilder designed exclusively for healthcare. Dr. Leonardo is a subscription-based service. Physicians, dentists, physical medicine specialists, veterinarians and related healthcare professionals use Dr. Leonardo to create their personal professional Internet profiles [Profile-Sites], while practices use Dr. Leonardo to create and manage the professional websites of their clinics. PROVIDER-Sites rank above online provider-directories (Healthgrades, Vitals, WebMD, et al) and are highly-effective tools for personal branding and professional reputation management.